Is Matcha Tea Really That Great For You? Everyone seems to be going crazy for Matcha tea and putting it in everything they can. But is it really worth joining in the Matcha Tea Party? Everyone is obsessed with Matcha at the minute. It’s all over the fashion shows and celebrities are drinking it everywhere. Cafes and restaurants are adding it to everything they can from soup to coffees. This Japanese green tea is definitely the new in thing for the wellness crowd. But what are the facts behind the claims? Here’s everything you need to know about Matcha tea. Matcha is a green tea that is ground to a fine powder and used in Japanese tea ceremonies. Matcha was introduced to Japan by the 8th century Zen priest Eisai. It was described as the ultimate remedy for mental and medical issues that helps complete your life. Matcha is filled with vitamins and minerals but the most important part of its make-up is all the polyphenol compounds known as catechins. Catechins are a kind of antioxidant. Matcha tea has tons of these catechines because it is ground up unlike other green teas. As a result it has three times the amount of one particular catechin known as epigallocatechin gallate, also known as EGCG. This particular antioxidant has been linked to fighting health problems like cancer and heart disease. There are other studies that say these catechins have other health benefits but the results have been inconclusive. Over 50 epidemiological studies that look at the correlation between drinking tea and cancer have been published since 2006. The National Cancer Institute of the US has said that even though the results are often inconsistent, they do make a case that drinking tea can reduce the risk of several cancers including colon, breast, ovary, prostate and lung. A different study, this one published in the American Journal of Clinical Nutrition, makes the correlation that drinking Matcha tea can help with weight loss. Yet further studies suggested that the delightful green tea can speed up recovery after a tough workout and improve immunity. Matcha also has a very small amount of caffeine that leaves drinkers with a level of alertness that comes without the jitters you might get from coffee. It Won’t Make Brownies Healthy Though! The National Cancer Institute also made the point that how healthy Matcha tea is depends on how you make and consume it. Even though iced Matcha and other teas are becoming more popular they often lack the same level of nutrients as brewed tea. Adding other ingredients further degrades the quality of the health benefits. So eating a Matcha brownie or drinking a Matcha smoothie or latte won’t be as healthy as drinking fresh brewed Matcha. Luckily Matcha tea is delicious even without adding anything extra to it. The owner of the Dorset-based tea merchant Comins Tea House has seen the rise in Matcha tea for himself. He doesn’t even mind that his customers enjoy the Matcha ice cream and truffles he makes as much as they prefer his regular teas. He believes that introducing people to Matcha through food is a good way to go. He says that it creates an interest in Matcha and in the idea of Japanese green tea itself. People who enjoy Matcha in food will go on to try it on its own. He wants to make sure that people who purchase Matcha only buy the highest quality Matcha made from plants grown in rural areas. The pollution of a suburban area or city can damage the tea. The price of Match tea depends on the quality of the tea. Please don’t waste high quality Matcha tea, often found at up to £30, on cooking. You can buy lower quality Matcha tea made for being an ingredient for far less than that. If you want to prepare the Matcha tea in the traditional Japanese way then start by measuring the tea into a heated bowl called a chawan using a bent bamboo spoon known as a chashaku. Then add hot (not boiling!) water. Around 70 degrees is the right temperature. Then whisk it up to a froth using a bamboo whisk called a chasen. This final step is how you get the great consistency of Matcha tea and it’s a step you need to take to get great tea. You should also appreciate and understand the ceremony. 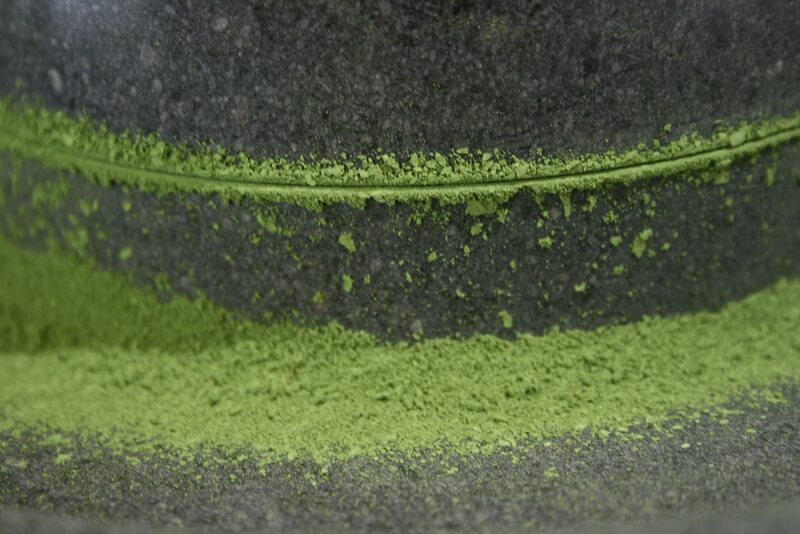 Part of the quality of Matcha comes from the ceremony. When you take a seat and observe proper tea preparation you enjoy the final result so much more than if you had just turned it in to a latte or smoothie.